Human Rights lawyer & recently married Amal Clooney resumed her official duties today after two weeks honeymoon with hubby, George Clooney. The couple got married in Italy on September 27. Mrs Clooney will be holding a series of meetings with government officials in Greece to advise the country's government on how best to persuade Britain to return the Elgin Marbles. She was formerly Amal Alamuddin but she has changed her name to her husband's name as listed on the website of her law firm Doughty Street Chambers. 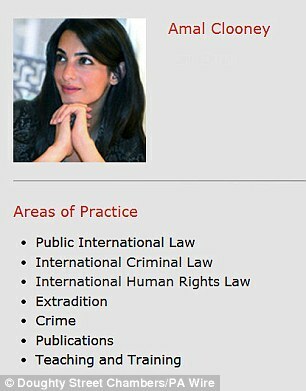 Amal Clooney is a barrister specialising in international law, extradition and criminal law.